After Worldwide Media Attention and Five Sold-Out Printings, 2016′s Most Talked-About Hero Returns for Her First Monthly Series! 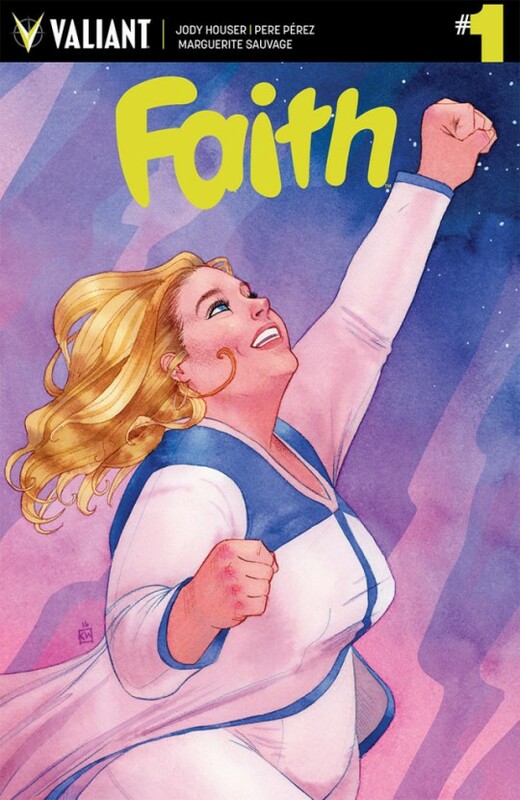 As revealed today by the New York Times, Valiant is proud to announce that Faith is stepping out of the pages of her five-time sold-out limited series debut and into the pages of her first-ever monthly title this July for FAITH #1 – the FIRST ISSUE of an ALL-NEW ONGOING SERIES from rising star Jody Houser (Orphan Black), Harvey Award-nominated sensation Pere Perez (ARCHER & ARMSTRONG), and acclaimed artistMarguerite Sauvage (DC Comics Bombshells)! Created by former Marvel Editor-in-Chief Jim Shooter (Secret Wars) and Eisner Award-winning writer and artist David Lapham (Stray Bullets) in Valiant’s acclaimed HARBINGERseries in 1992, Faith has long been a central icon of Valiant’s award-winning publishing line. 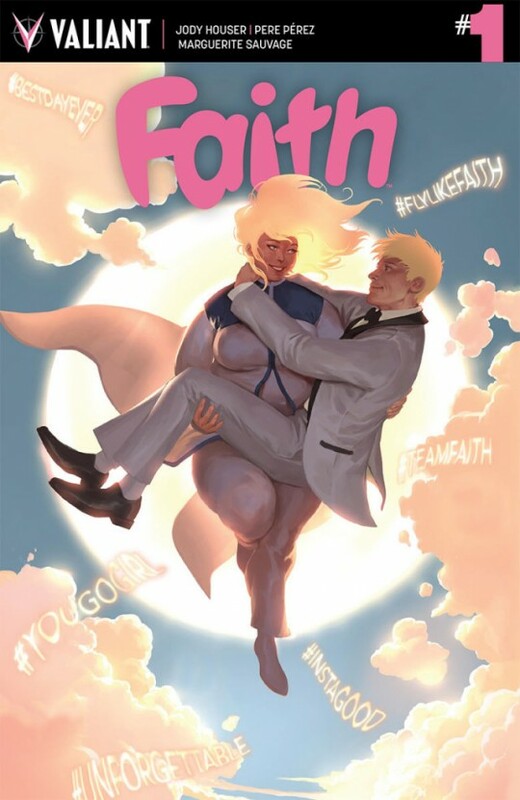 Then, in January 2016, Faith took her long-awaited, much-demanded first step toward solo stardom with FAITH #1 (of 4) – a groundbreaking debut that quickly became the first and biggest breakout hit of the New Year from any major comics publisher. In the weeks since, Faith’s solo debut has garnered near-universal critical acclaim; generated attention from some of the world’s biggest media outlets including the BBC, the Guardian, the HuffingtonPost, NPR, People, Today, the Washington Post, and dozens more; and become the first series of 2016 to reach a much-vaunted fifth printing – making it one of only a handful of hit series in the past decade to achieve that pivotal benchmark of fan and commercial demand. On July 20th, don’t miss history in the making when the colossal comics milestone of the summer arrives with the brand-new FAITH #1 – featuring covers by a staggering cast of comics talents, including Kevin Wada (She-Hulk), Jelena Kevic-Djurdjevic (DIVINITY), Cary Nord (X-O MANOWAR), Emanuela Lupacchino (Superwoman), Pere Perez (HARBINGER WARS), Kano (Gotham Central), and Colleen Coover (Bandette)! 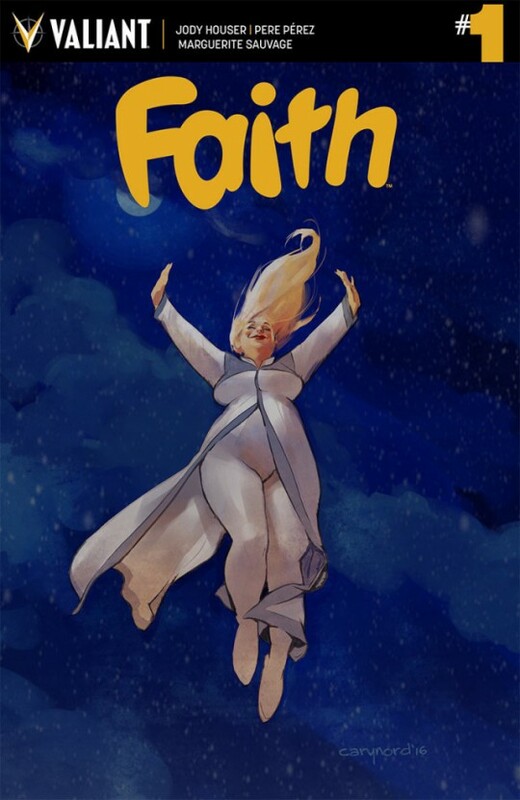 Jump on on board here and find out why Valiant’s high-flying hero has captured the imagination of the world – and inspired a whole new generation of comics fans – when FAITH #1 hits comic shops everywhere on July 20th! Plus: Go back to the beginning and relive Faith’s headline-grabbing solo debut with theFAITH VOL. 1: HOLLYWOOD AND VINE trade paperback collection – also on sale in July! 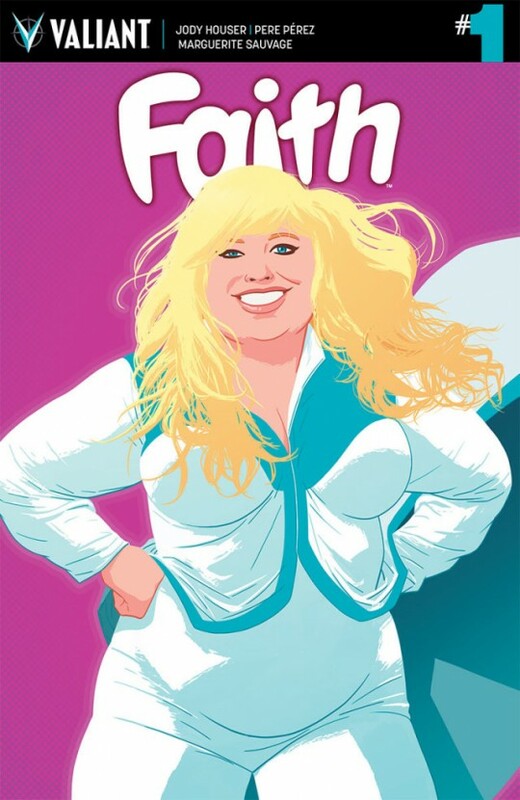 Re-presenting all four issues of the sold-out limited series that catapulted HARBINGER’s leading heroine into superhero stardom for just $9.99, get primed for Faith’s first ongoing series here as all-star creators Jody Houser, Francis Portela, and Marguerite Sauvage begin the story that made Faith a full-on comics sensation! And look for the precedent-setting FAITH #1 (of 4) FIFTH PRINTING – on sale on April 27thalongside the final issue of Faith’s solo mini-series debut in FAITH #4 (of 4)!